The venus flytrap (Dionaea muscipula) is a carnivorous plant that catches and digests animal prey consisting mostly of insects and arachnids. The trapping structure is formed by the terminal portion of each of the plant's leaves. The edges of a venus flytrap leaf are equipped with teeth-like protrusions called cilia, while the inside has red pigmentation that attracts insects. The venus flytrap reveals the remarkable diversity in nature—a carnivorous plant containing several traps that can snap shut in milliseconds to capture prey. This diversity contributes to the human wonder and joy from nature. The venus flytrap is found in nitrogen-poor environments, such as bogs. 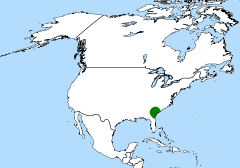 Although it has been successfully transplanted and grown in many locales around the world, the venus flytrap is found natively only in North and South Carolina in the United States; one such place is North Carolina's Green Swamp. The nutritional poverty of the soil is a reason for the plant to have such elaborate traps as an adaptation: insect prey provide the nitrogen for protein formation that the soil cannot. The venus flytrap is not a tropical plant and can tolerate mild winters. The plant's name refers to Venus, the Roman goddess of love and plant life. The venus flytrap is a small herb, forming a rosette of four to seven leaves, which arise from a short subterranean stem that is actually a bulb-like rhizome. Each leaf reaches a maximum size of about three to seven centimeters, depending on the time of year (Rice 2007). Longer leaves with robust traps are generally formed after flowering. Flytraps that appear to have more leaves are generally colonies, formed by rosettes that have divided beneath the ground. Each leaf blade is divided into two regions: a flat, heart shaped photosynthesis-capable petiole, and a pair of terminal lobes hinged at the midrib, forming the trap, which is actually the true leaf. The upper surface of these lobes contains red anthocyanin pigments and its edges secrete mucilage. Venus flytraps produce white flowers in the spring. The seeds are small, shiny, and black. The terminal lobes, hinged at the midrib, exhibit rapid plant movements, snapping shut when stimulated by prey. The trapping mechanism is tripped when prey items stumble against one of the three hair-like trichomes that are found on the upper surface of each of the lobes. The trigger hairs must be touched twice in quick succession, preventing non-prey stimuli such as raindrops from triggering the trap, whereupon the lobes snap shut in around 100 milliseconds. The edges of the lobes are fringed by stiff hair-like protrusions or cilia, which mesh together and prevent large prey items from escaping. These protrusions, and the trigger hairs, are probably homologous with the tentacles found in this plant’s close relatives, the sundews. The holes in the meshwork allow small prey to escape, presumably because the benefit that would be obtained from them would be less than the cost of digesting them. If the prey is too small and escapes, the trap will reopen within 12 hours. If the prey moves around in the trap, it tightens and digestion begins more quickly. The speed of closing can vary depending on the amount of humidity, light, size of prey, and general growing conditions. The speed with which traps close can be used as an indicator of a plant's general health. 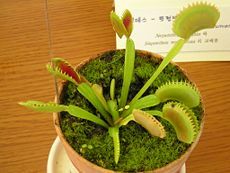 Venus flytraps are not as humidity dependent as are some other carnivorous plants, such as Nepenthes, Cephalotus, most Heliamphora, and some Drosera. 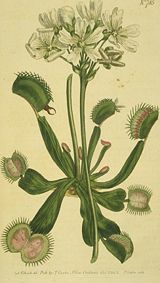 The venus flytrap is one of a very small group of plants that are capable of rapid movement, such as Mimosa, the telegraph plant, sundews, and bladderworts. The mechanism by which the trap snaps shut involves a complex interaction between elasticity, turgor, and growth. In the open, untripped state, the lobes are convex, but in the closed state, the lobes are concave, forming a cavity. It is the rapid flipping of this state that closes the trap, but the mechanism by which this occurs is still poorly understood (Forterre et al. 2005). When the trigger hairs are stimulated, an action potential mostly involving calcium ions is generated, which propagates across the lobes and stimulates cells in the lobes and in the midrib between them (Hodick and Sievers 1988). Exactly what this stimulation does is still debated: cells in the outer layers of the lobes and midrib may rapidly secrete protons into their cell walls, loosening them, and allowing them to swell rapidly by osmosis and acid growth. Alternatively, cells in the inner layers of the lobes and midrib may rapidly secrete other ions, allowing water to follow by osmosis, and the cells to collapse. Both, either or neither of these mechanisms may play a role in the plants trapping mechanism (Hodick and Sievers 1989). If the prey is unable to escape, it will continue to stimulate the inner surface of the lobes. This causes a further growth response that forces the edges of the lobes together, eventually sealing the trap hermetically and forming a "stomach" in which digestion occurs. Digestion is catalyzed by enzymes secreted by glands in the lobes. Digestion takes about ten days, after which the prey is reduced to a husk of chitin. The trap then reopens, and is ready for reuse—even though the trap rarely catches more than three insects in its lifetime. Venus flytraps are very popular as cultivated plants, although they have a large reputation for being difficult to grow. This reputation is almost exclusively due to inappropriate treatment of the plants by retailers and their consequent ill-health on purchase. Venus flytraps are not houseplants and should be grown in pots under conditions that mimic those in their natural habitat. Venus flytraps should be kept in pots on a patio, deck, or position in the garden that receives at least six to eight hours of sunlight per day (Sarracenia Northwest 2007). In areas of lower humidity, it is best to place the plants in very wide water trays in an attempt to increase humidity levels. Better still, is to grow venus flytraps in a greenhouse, which often leads to healthy, vigorous, and colorful plants. The color of the trap leaves may be used as an indicator of sufficient light. In appropriate conditions, the inside of each trap should be bright red in color for most varieties. In insufficient light, the inside of the traps turn light green. Low light also causes etiolation, producing plants with long weak stems in an attempt to reach areas with more sunlight. Unfortunately, this also makes the plants more susceptible to diseases. Venus flytraps are best grown in mixtures of sphagnum peat moss and/or peat, often with the addition of sand, perlite, or other inert salt free material. Soil pH should be in the range of 3.9 to 4.8. Venus flytraps ideally should not be watered with tap water, as accumulated salts in tap water may kill carnivorous plants. Soft water with total dissolved solids (TDS) of 100 parts per million (ppm) or less yields good growth; both distilled water or clean rain water are ideal. The soil should be kept constantly moist by placing the pot in a tray full of water, with the root bulb of the plant allowed to be above the level of the water at least part of the time, to prevent root rot in stagnant water. There is no danger of over-watering. Venus flytraps can survive short periods of immersion underwater (Sarracenia Northwest 2007). Some horticulturists have experimented with giving small amounts of fertilizer to venus flytraps, usually applying diluted solutions of products formulated for epiphytes, using cotton swabs, to the plant's foliage. Another method of fertilizer application is a spray bottle or pump. Beginners, however, and those without expendable plants, would be wise to avoid fertilizer in favor of insects. The temptation to trigger the traps manually should be resisted. Venus flytraps are entirely capable of catching their own food; thus, feeding them manually is not necessary. If for some reason a grower wishes to feed a flytrap, live insects no larger than one-third of the size of the trap may be used, as larger insects tend to have a detrimental effect on the plant as they often drastically shorten the individual trap's life and/or cause it to die. Algal growth near the plant is an indicator of overfeeding, as is an abundance of dead, black traps. 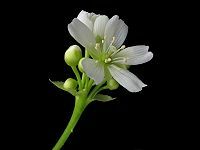 Healthy venus flytraps will produce scapes of white flowers in the spring; however, many growers remove the flowering stem early, as flowering consumes some of the plant's energy, and reduces the rate of trap production. If allowed to flower, successful pollination will result in the production of dozens of small, shiny black seeds. Venus flytraps have a necessary winter dormancy period, triggered by nighttime temperatures below 10 °C (50 °F) and reduced day length (Sarracenia Northwest 2007). In climates with mild winters, they can be kept outside to overwinter (hardiness zone 9 or greater). The soil should be kept slightly moist and the area well ventilated to prevent the growth of gray mold. Those who live in areas with extremely cold winters (hardiness zone 8 or less) might consider placing plants in a plastic bag in the refrigerator for two to three months, starting in autumn, although they can survive freeze-over for brief periods of time (Sarracenia Northwest 2007). Plants can be propagated by seed, although seedlings will take several years to mature. More commonly, the plants may be propagated by division in spring or summer. Venus flytraps are, by far, the most commonly recognized and cultivated carnivorous plant. They are sold as houseplants and are often found at florists, hardware stores, and supermarkets. Although the genus is monotypic, with one species, during the past ten years or so, large quantities of cultivars have come into the market through tissue culture of select genetic mutations. It is through tissue culture that great quantities of plants are raised for commercial markets. An unofficial list includes many more names, with more added annually. None of these "variation names" are officially recognized unless the name is properly documented, registered, and accepted by the only official CP name registrant, the International Carnivorous Plant Society. ↑ Schnell, D., P. Catling, G. Folkerts, C. Frost, B. Gardner, et al. 2000. Dionaea muscipula. 2006 IUCN Red List of Threatened Species. Retrieved June 20, 2007. Forterre, Y., J. M. Skotheim, J. Dumais, and L. Mahadevan. 2005. “How the venus flytrap snaps.” Nature 433: 421-425. Retrieved June 20, 2007. Hodick, D., and A. Sievers. 1988. “The action potential of Dionaea muscipula Ellis.” Planta 174(1): 8-18. Retrieved June 20, 2007. Hodick, D., and A. Sievers. 1989. “On the mechanism of trap closure of Venus flytrap (Dionaea muscipula Ellis).” Planta 179(1): 32-42. Retrieved June 20, 2007. Rice, B. 2007. Venus flytraps: A tutorial. The International Carnivorous Plant Society. Retrieved June 20, 2007. Sarracenia Northwest. 2007. “Venus flytrap: Dionaea muscipula.” Sarracenia Northwest. Retrieved June 20, 2007. This page was last modified on 20 January 2016, at 15:48.